A current project for Lapin Services was to do a Storm System Restoration Project in the Lake Nona area where the storm system needed to be reclaimed from overgrown vegetation. A short while later, when Mr. Payne got to the property, he searched for hidden drains to be restored to the grassy and wooded areas. My “before” photos for Lapin Services were being done during this process while Pat guided me. Then it happened! While being engrossed in my photography, I felt movement around my left ankle and up my leg. I jumped, shrieked, and yelped while violently shaking my leg. At this sound and sight, Pat was violently shaking and shrieking also…with laughter! I turned around, and Pat was laughing with hilarity while still holding the stick he used to tickle me. Okay! I found it funny too, later, after I calmed down! When the humor was over I couldn’t help but notice the similarity here of what was going on in this Storm System Restoration Project and some scriptural accounts with the children of Israel. They too had their “giants” of a different nature from which to surmount and retake the land. Similarly, Lapin Services also has a strong, capable, team that do an excellent job! 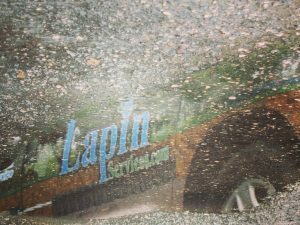 Lapin’s team of “technicians” are at your service, 24 hours a day, 7 days a week. Jeff, a Lapin Services technician, says, “Overgrowth clearings for storm water and maintenance and rejuvenation of retention ponds are just a couple of our services.” Give Lapin Services a call at 407-841-8200 to assist you with your needs.